People who want to hear the spine-tingling bugle of an elk often think they have to travel west to do so. But the reality is they can have that experience in Minnesota. 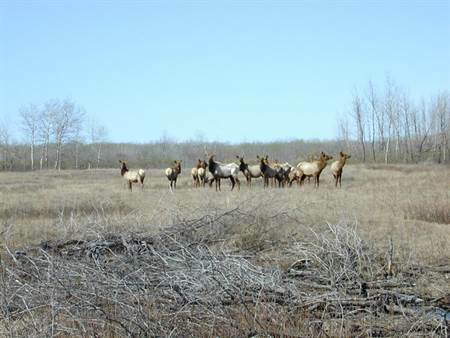 These are elk at the Skull Lake Wildlife Management Area. Elk, which are members of the deer family and can weigh up to 900 pounds, once were found throughout the majority of Minnesota. (The only exception was the northeast part of the state, which was home to woodland caribou.) Overhunting reduced elk numbers almost to extinction despite a series of state government-led efforts in the early 1900s, and the last native elk was spotted in the Northwest Angle in 1932. Reintroduction efforts were undertaken shortly thereafter, which led to the current Grygla herd. The Caribou-Vita herd appeared in the 1980s, though it’s unclear if the animals ventured south from Canada or north from the established Grygla herd. Today, Kittson and Marshall counties in northwest Minnesota are home to three herds of elk that total as many as 200 animals. The largest group, the Caribou-Vita herd, includes 120 to 150 animals that migrate between Kittson County in Minnesota and Manitoba, Canada. The Kittson-Central herd, located near Lancaster in Kittson County, includes about 35 elk. There are about 20 elk in Marshall County’s Grygla herd. People have the opportunity to see elk from all three herds, and limited hunting opportunities exist, too. The Minnesota Department of Natural Resources offers elk-hunting licenses via lottery, and it’s considered an once-in-a-lifetime hunt. There are seven licenses available for the 2016 hunt, which runs Sept. 10-18. If the goal is to see wild elk—or even hear them bugle (a low whistling sound) during the fall rut—it’s important to keep in mind the type of habitat in which they live. Elk prefer to forage in open brushlands and grasslands and then retreat to forested areas for protection from predators and for cover during the winter. Dawn and dusk are two of the best times to see elk. There are a variety of places where people can see and, in the fall, hear wild elk. The best opportunity to view the Kittson-Central herd is by driving along roads about 10 miles north and east of Lancaster. The 7,000-acre Skull Lake Wildlife Management Area also is a good spot. To see animals from the Grygla herd, focus on roads north of the town of Grygla, the 55,000-acre Thief Lake Wildlife Management Area and the Agassiz National Wildlife Refuge. The best place to see elk from the Caribou-Vita herd is on the eastern part of the Caribou Wildlife Management Area in northern Kittson County. 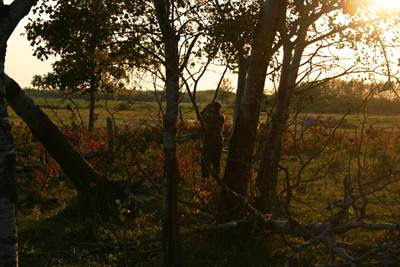 Focus your time here during September and October, looking for elk foraging in clearings as the sun rises and sets. Throughout the year, elk tend to hunker down out of sight for long stretches of the day. That gives people the opportunity to experience what else this unique part of Minnesota has to offer. The Kittson County History Center and Museum in Lake Bronson provides insight into the history of the county, while Far North Spirits in Hallock is the northernmost distillery in the contiguous United States. Many of the towns in Kittson and Marshall counties feature golf courses, and cities such as Hallock, Karlstad, Thief River Falls and Warren offer hotels and motels. Nature-lovers and campers also will appreciate the opportunities available at Old Mill State Park and Lake Bronson State Park. Those who are feeling particularly adventurous can make the easy trip to the massive Lake of the Woods, which features excellent fishing and a wide variety of resorts.